Simon Fell won a British title. Three local athletes struck gold at the British Masters Indoor Championship at the weekend. Nene Valley Harriers sprinter Ricky Huskisson was again in red-hot form on the boards at Lee Valley dashing home first in the Over 55 60m final in a time of 7.78 seconds. He won his heat in 7.90. The 55 year-old also picked up a medal in the 200m, claiming the silver in a time of 25.51. Corby’s Dougie Donald denied him a golden double with a time of 25.48. Huskisson also won the South of England 60m and 200m titles at the same venue last month. John Blackwell was another Nene Valley man to do well. He claimed a full set of medals in the Over 60 age group, winning gold in the javelin with 28.48m, silver in the discus with 33.76m and bronze in the shot with 10.10m. Simon Fell of Stamford Striders was another local winner at the big meeting. He took the honours in the Over 35 1500m in 4.24.32, finishing just ahead of runner-up Robert Prady from Nene Valley Harriers (4.26.77). Two more Nene Valley men, Julian Smith and Tim Needham, were also medal winners. Smith was third in the Over 45 200m with 25.17 and Needham won a bronze in the Over 60 discus with his 33.74m. 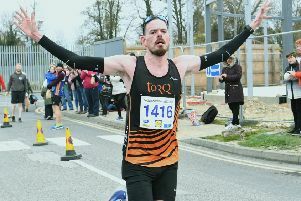 Stamford-based Aaron Scott, running for Notts AC, won the Cambridge Half-Marathon on Sunday for the second year running. He cruised to an overwhelming victory, crossing the line in 68.48 to win by nearly four minutes. Runner-up Chris Darling from Cambridge clocked 72.28. There were over 4,000 runners.